22 MMS November 2017 mmsonline.com ONE-OFF Commentary The workforce development panel I moderated at our Top Shops conference this past Septem- b e r i n I n d i a n a p o l i s, I n d i a n a, c o n s i s te d of a diverse group of people from different organiza- ti o n s. O n e p a n e l i s t wa s M i ke G r i f f i th, c h i ef operating of ficer of Indianapolis-based Major To o l a n d M a c h i n e, a 6 0 0,0 0 0 - s q u a r e -f o o t operation with 400 employees. As Mr. Grif fith mentioned, not only does the size of this company present unique challenges in terms of attracting, developing and retaining manufacturing employ- ees, but so does its location. Competition for employees in Indiana is high, given that the state has more than 8,000 manufacturers. The shop realizes this requires significant effort and invest- ment on its part to attract the best and brightest. Here are three examples of challenges cited during our panel discussion: • Employee development. In-house train- ing is recognized as essential, which is why Major Tool a nd Machine has a f ull-time machining instructor and offers a formal machinist training program. The six-month program targets students from technical colleges and high school vocational programs. 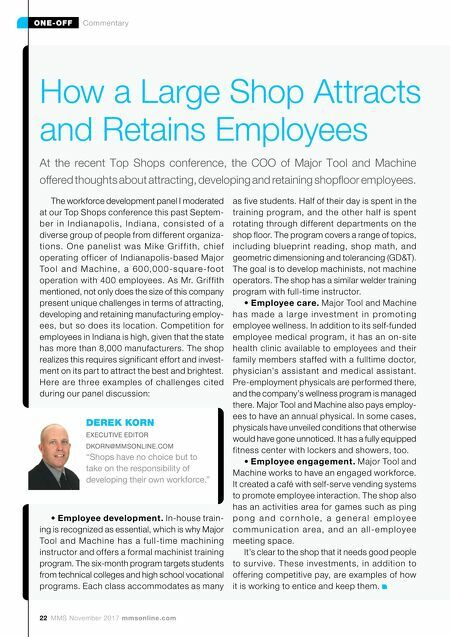 Each class accommodates as many How a Large Shop Attracts and Retains Employees At the recent Top Shops conference, the COO of Major Tool and Machine offered thoughts about attracting, developing and retaining shopfloor employees. as five students. Half of their day is spent in the training program, and the other half is spent rotating through dif ferent depar tments on the shop floor. The program covers a range of topics, including blueprint reading, shop math, and geometric dimensioning and tolerancing (GD&T). The goal is to develop machinists, not machine operators. The shop has a similar welder training program with full-time instructor. • Employee care. Major Tool and Machine h a s m a d e a l a r g e i nve s t m e n t i n p r o m ot i n g employee wellness. In addition to its self-funded employee medical program, it has an on-site health clinic available to employees and their family members staffed with a fulltime doctor, physician's assistant and medical assistant. Pre-employment physicals are performed there, and the company's wellness program is managed there. Major Tool and Machine also pays employ- ees to have an annual physical. In some cases, physicals have unveiled conditions that otherwise would have gone unnoticed. It has a fully equipped fitness center with lockers and showers, too. • Employee engagement. 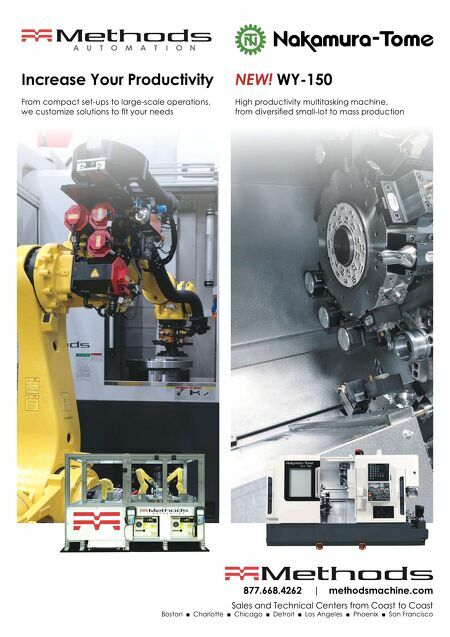 Major Tool and Machine works to have an engaged workforce. It created a café with self-serve vending systems to promote employee interaction. The shop also has an activities area for games such as ping p o n g a n d c o r n h o l e , a g e n e r a l e m p l o y e e c o m m u n i c a t i o n a r e a , a n d a n a l l - e m p l oy e e meeting space. It's clear to the shop that it needs good people to sur vive. These investments, in addition to offering competitive pay, are examples of how it is working to entice and keep them. DEREK KORN EXECUTIVE EDITOR DKORN@MMSONLINE.COM "Shops have no choice but to take on the responsibility of developing their own workforce."